But as the Koch influence on national politics has grown over the years, their spending has become an increasingly difficult secret to keep. For example, in the final week of the 2014 election, the brothers invested $6.5 million on behalf of just 6 Republican Senate candidates. As their role in Republican politics gets more widely known, their targets are willing to point this out. The Kochs are so active that associating Republican candidates to them has become almost routine. There’s been so much of this lately, that the Koch Brothers have begun a PR campaign to improve their image. 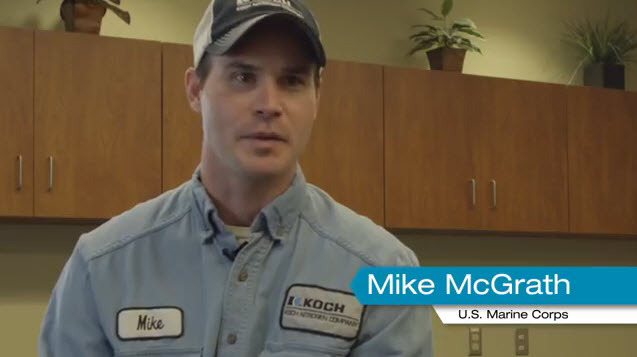 These include TV commercials featuring Koch employees that served in the military and now newspaper Op Eds placed by surrogates extolling the many virtues of the Koch Brothers. A recent such Op Ed appeared in the Midland Daily News. The writer credit said only: “Timothy G. Nash … vice president and economics professor at Northwood University.” A particularly gushing review of the Koch Brother’s heroic contribution to our society (“Every now and then, you come across exceptional people who by their leadership, courage, vision, principles, and imagination have literally changed the world.”), the piece failed to point out that the writer is part of the Koch machine. 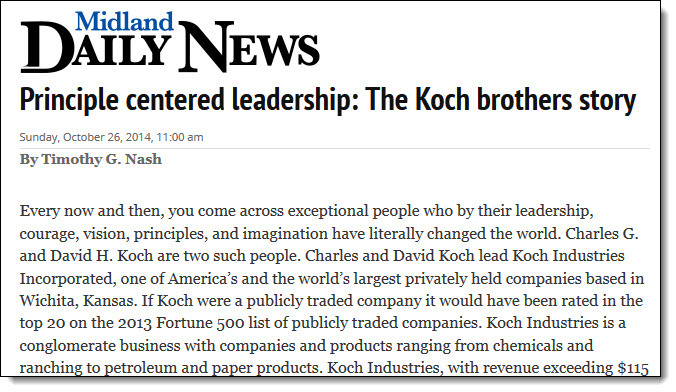 … the Midland Daily News failed to reveal Nash’s own significant and beneficial relationship to the Koch brothers. In February 2011, Nash was announced as the director of the Koch Scholars program at Northwood University, which is funded by the Charles G. Koch Charitable Foundation. 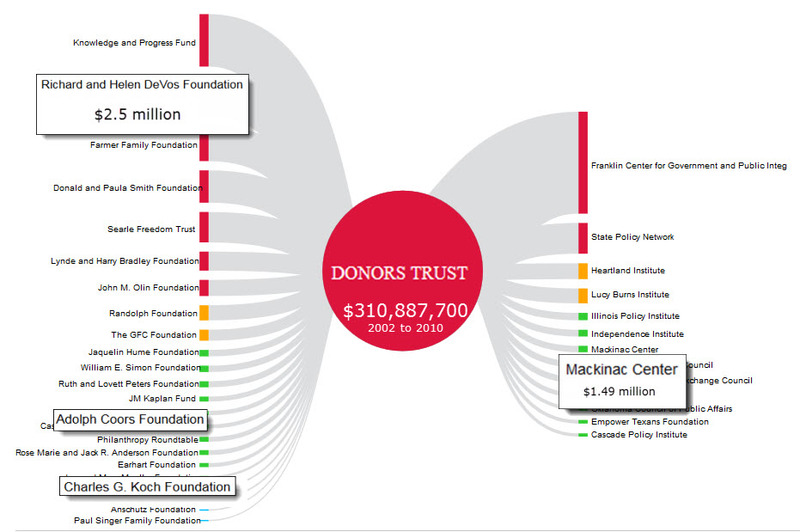 Between 2010 and 2012, the Mackinac Center received $1,494,000 from the Koch conduits DonorTrust and Donors Capital Fund. Donors Capital Fund is organized, under yet another Internal Revenue Code section, as a 509(a)(3) “supporting organization”. Using this little-known regulation serves to bury money as part of the “murky money maze.” Corporations that donate (at least $1 million each) can make it even harder to track their money. Investor pitch from the Donors Capital Fund website. … a charity that carries out its exempt purposes by supporting other … public charities. This classification is important because it is one means by which a charity can avoid classification as a private foundation, a status that is subject to a more restrictive regulatory regime. Donor’s Capital Fund is a massive dark money operation, funneling over $310 million tax-free dollars to a long list of members of the right wing echo chamber, including Muskegon’s Education Action Group as well as the Mackinac Center’s forerunner, the Heritage Foundation. IRS tax returns show the Charles G. Koch Foundation and the Coors Foundation are Donors Trust funders, and that the Richard and Helen DeVos Foundation alone provided $2.5 million. So while right wing foundation funding to Donor’s Trust/Capital is discoverable, none of the corporate funding can be uncovered. That, after all, is the whole point to Donor’s Capital Fund.